I am working on a 2D unstructured code in C++. I am using gmsh to generate a 2D unstructured mesh and reading it into my program with a library called GMSH_IO. Now that I have the data, I would like to write it to a VTK file for visualization in Paraview. I could do this manually, but I am curious if anyone knows of a library for writing unstructured meshes to VTK files for visualization? 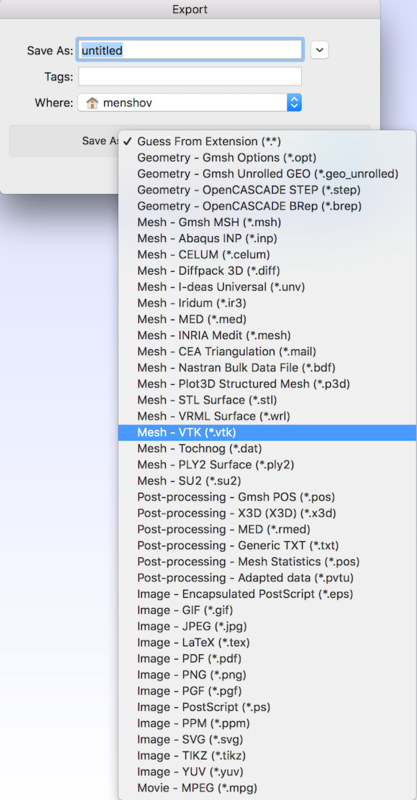 I think you are looking for Kitware VTK, basically, the main library for interaction with VTK files. Examples page will contain a lot of samples, including the one you are looking for: output of an unstructured grid. Not the answer you're looking for? Browse other questions tagged visualization unstructured-mesh paraview gmsh or ask your own question.